It’s been an interesting and long week while breaking in a rescued dog and keeping the peace with our other two dogs while hubby is out-of-town on business travel. There has been a lot of challenges with Skipper since he decided to move in with us on Friday. He is a sweet, well trained dog who is calm and very friendly. But he’s also a senior dog that frequently needs to pee multiple times an hour and drinks tons of water which could be caused by varying heath issues. I have a vet appointment for him tomorrow to try and find out what the issues are and have been at my wick’s end a few times this week trying to watch and get Skipper outside enough times and lots of cleanup when I can’t which is mainly through the night. It hasn’t been making for great nights of sleep for me! 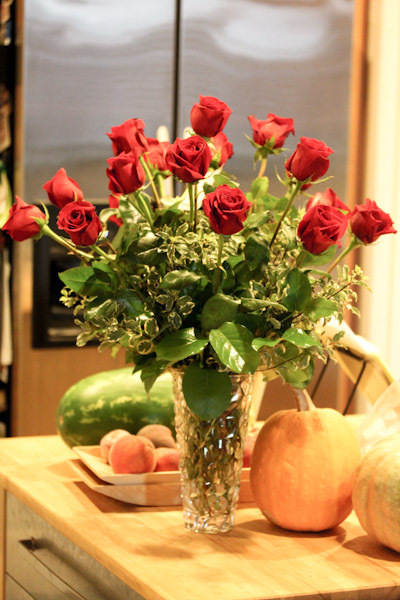 But these sweet roses hubby sent for our anniversary helped! Since I’m feeling a little frazzled, I was not too inspired for dinner and wanted to keep things simple which usually means a huge salad for me. 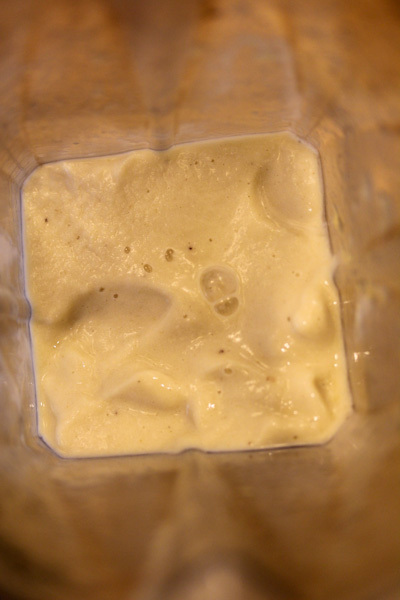 I got completely experimental throwing simple ingredients into the blender for a dressing and it came out really good! Place all ingredients into a blender and blend on high until smooth and creamy. Makes 2-4 servings. 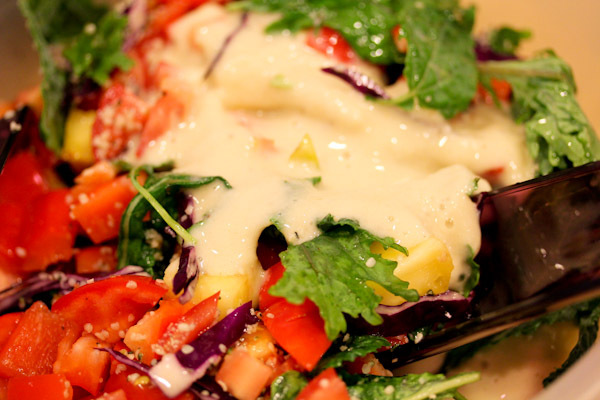 For a low-fat, oil-free dressing, it has a creamy and thick texture. I coated a kale salad in it. And called a large serving dinner. 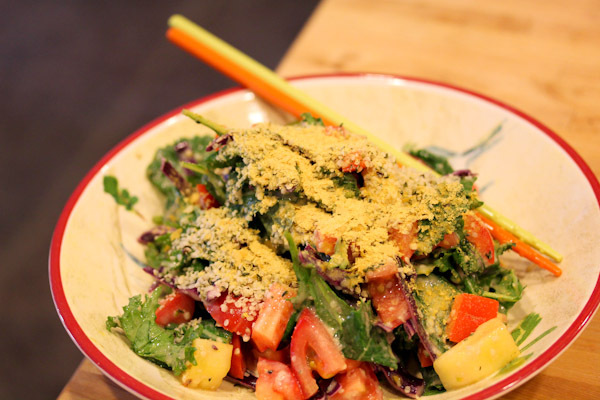 The dressing is sweet, tangy, and sour all at once adding a lot of flare to a simple salad. Our dog is 12 and he’s in the drinks lots of water and has to go outside to pee a lot stage. A doggy door helps, but we still do lots of cleanup! I imagine this is a little glimpse of what having children is like. So true on children, I feel like we have a toddler I have to watch constantly in the house. 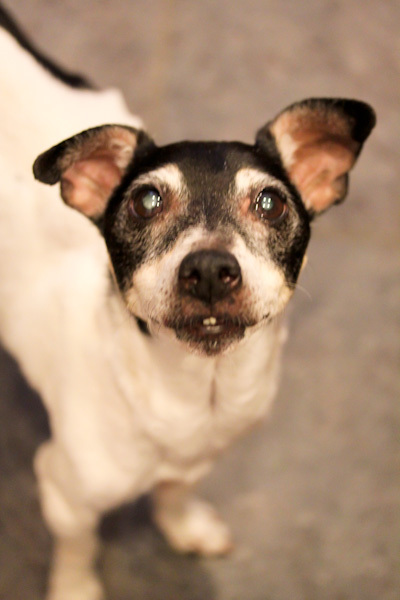 The diagnosis from the vet is genetic diabetes which can happen to some older dogs. We can try to manage it better with a high fiber diet or treat it with insulin shots twice daily which isn’t cheap or easy. We’re considering a doggy door, but that’s a problem with our indoor cats. For now he’s been spending a lot of time in our backyard which he seems happy with, but I need a better solution for the winter. Yikes, sounds stressful, as if your job isn’t crazy enough, right! Good luck at the vets’s, hope it is something treatable. Thanks, we found out at the vet that he has diabetes, a pretty serious genetic version that causes him to drink tons of water and pee a lot. We’re looking at our treatment options now from a high fiber diet to insulin shots twice daily which isn’t cheap :-(, but because of the amount he has to pee – we’re basically keeping him in the backyard most of the time which I feel bad about even though it does not seem to bother him. Aw, what a lucky little boy! He must have known you were animal lovers!! And what a great idea to sweeten a dressing with banana. 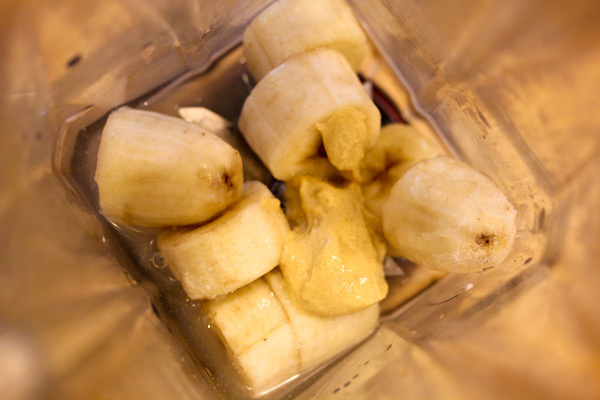 I love whole fruits in my dressings, but I’ve never tried banana. Nice! Thanks, he’s a sweetie and I hope everything goes good at the wet today. My inlaws use incontinence bed pads for their dog. The ones for humans are cheaper than the ones especially for dogs. Maybe that can help? Again, you are so wonderful for taking Skipper into your home. Thanks for the advice, I will look into. The diagnosis from the vet is diabetes and a pretty serious case that’s causing him to drink huge amounts of water and pee in large amounts frequently. We can try to manage it better with a high fiber diet or give him insulin shots twice a day which isn’t easy or cheap. But because of the amount he has to pee currently, we’re keeping him in the backyard a lot of the time and letting him in when I can watch him which I feel bad about. Hopefully it’s temporary while we look at other options. I’m not into Bananas but this is darned CLEVER! Neat! Happy Belated Anniversary! Between your blog and instagram I have been keeping an eye on your progress with Skipper! HUGS to you all!